A Simple vegan tabouli recipe made with Amaranth grain that takes minutes to make and can be the perfect healthy lunch or an easy side dish. Have you eaten a recipe so many times, and, yet never made it yourself? This is the case with me and tabouli! Its one of the most colorful recipes ever and its crazy simple to make. Yet, it never occurred to me to make it at home. – Tabouli is a traditional Levitan recipe, which is the common name for the area of Eastern Mediterranean sea. Is it “Tabouli”, “Tabouleh”, “Tabbouleh” or “Tabbouli”? I think the traditional version to say it is “Tabbouleh” which is how I have seen it being spelled out by middle Eastern chefs and bloggers. 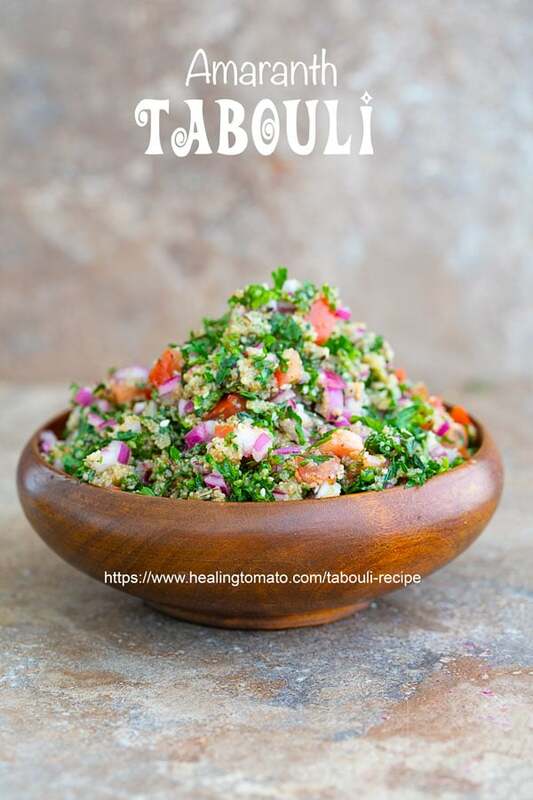 Personally, I have always referred to it as “Tabouli” because that’s how I saw it the first time. I was in Zeytuna restaurant circa 2006. This is a grocery store / buffet type recipes located in lower Manhattan. This restaurant had a wide variety of world cuisine and they were famous for their 2-story building. There wasn’t any food item you didn’t find in their location. That, to me, is the definition of a world market. They still have tabouli on their menu which they make with Bulgar wheat. I remember tasting it for the first time and it was the most delicious salad I had tasted. After that, I have tasted tabouli in many places and it was delicious everywhere. Hummus and tabouli are the best levitan recipes. Speaking of hummus, have you tried my parsley hummus or my beet hummus? Tabouli should not be frozen because it’s mostly parsley. 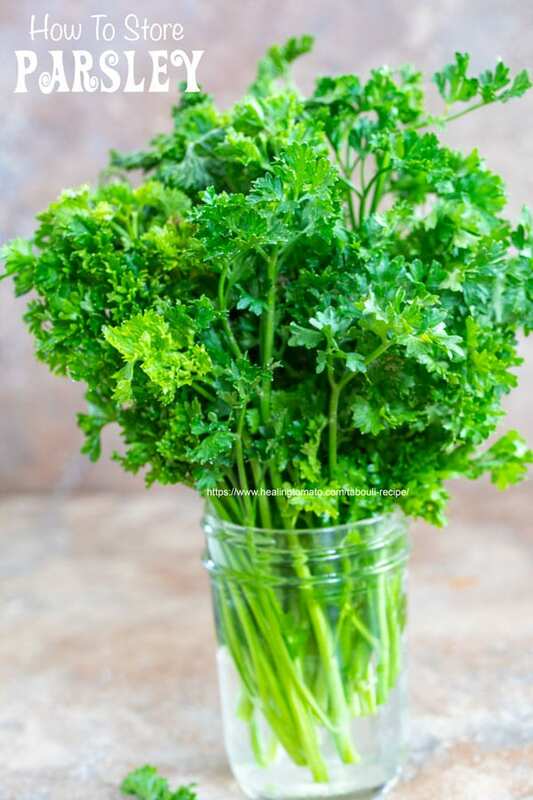 Parsley doesn’t do well when frozen because it will look black in color when thawed. Also, parsley looses its flavor when frozen without oil or butter. The best way to store it is to place it in glass container(s) and put it in the warmest part of your refrigerator. Also, use it within 3 days to get the best taste out of it. If you want, you can make the amaranth in advance and freeze it. Amaranth can stay about 1-2 weeks after its cooked. Be sure to warm it up and burn off any liquid in it before you put it in any recipe. What grains can be added to Tabouli? – Quinoa – Quinoa is the most obvious and safe substitute for bulgur. Its light, airy and just flavorless enough to soak up the flavors of parsley. If you want to be a little daring, try the sprouted quinoa that I used in this rustic quinoa recipe. 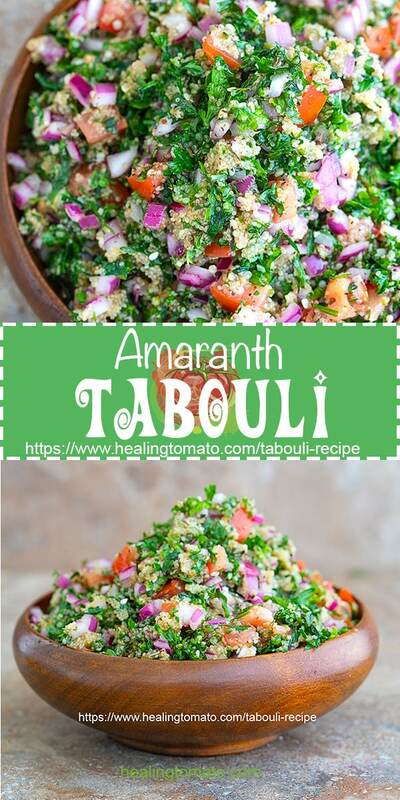 – Amaranth – Amaranth is the perfect grain to put in a tabouli recipe. Its mild in flavor, so, it will not over power the parsley and it will also give a wonderful contrasting color to the greens and reds of the recipe. In my amaranth post, I show you all the brick-and-mortar or online locations you can purchase Amaranth. – Brown rice – Brown rice is dense and starchy. Putting it in a tabouli recipe might be taking a leap of faith which will pay off! I have used it in a vegan meatloaf recipe and it was the best way to make meatloaf. – Farro – I have found farro to be very versatile and it would be perfect substitute. If you haven’t had the chance to try it in a recipe before, make a healthy farro salad and you will see how delicious it tastes. – Cauliflower Rice – I saw Alton Brown make this recipe almost 15 years ago, in true Alton Brown fashion. – Kamut – Better known as Khorasan Wheat, its a whole wheat ancient grain. I haven’t worked with it before, so, I am not sure how great it will be, but, I have seen several recipes made with it. Its definitely something I would love to experiment. – Barley – Barley is slightly denser in texture and its a tad larger in size. However, it would still be delicious with parsley in a tabbouleh recipe. Check out my barley pilaf recipe for a completely different way of using this grain. – Orzo – This is more of an outside-the-box ingredient to use in a tabbouleh recipe. I have never tried in a recipe like that. Since I know how great it tastes in soup, I am confident that cooked orzo will work in a tabbouleh recipe. Try it and let me know how it turns out. I decided to make mine healthier by uses a lot less oil in mine. You won’t miss the extra oil because all the ingredients are blended perfectly together. Which Parsley To Use In Tabouli? Italian flat-leaf parsley is the best and the most commonly used parsely in tabouli. It has strong flavor and it blends with with bulgur, onions and other ingredients. I am a fan of curly parsley only and I make no bones about it. I prefer the texture, color and flavor of curly parsley any day. Also, I LUH-ved how well curly parsley and amaranth worked together. There was no question in my mind that they were a match made in heaven. – Cover with the top with a (affiliate link) clear shower cap and place in the refrigerator. The shower cap with prevent the parsley from getting freezer burns. It will also prevent the aroma of the parsley to overwhelm when you open the fridge. How To Use Leftover Parsley? Parsley, like any other herb, will go bad and make me sad! I spend so much money on it and it makes me sad to see it go to waste. Most of the time, I can’t use it up in time which just means I wasted $3 on a perfectly good bunch of parsley. A few years ago, I had so much parsley leftover that I didn’t know what to do with it. I gave it to friends and family, but, I still had so much left over. So, I turned the remaining parsley into a delicious parsley hummus recipe and its been a fan favorite since then. This navy beans salad is my favorite salad of all time. I mixed navy beans, parsley and other ingredients to make this awesome year round salad recipe. It has a healthy amount of parsley in it, so, you may end up eating the whole bowl and not feel an ounce of guilt. 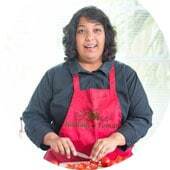 I created a special search option, so, that you can see all my parsley recipes by clicking here. This recipe also allowed me to make use of my favorite spice. Za’atar is so aromatic and flavorful which makes it the perfect spice to add in this tabouleh recipe. Za’atar was the main ingredient in this mixed nuts, tabouli, and muhammara recipe I made. Trust me you haven’t had nuts taste so delicious and healthy. Hemp seeds are not at all normal in tabbouleh recipe, but, I thought they would be perfect in it. It adds an added nutrition to it, which just makes me so happy. If you like this hemp recipe, I think you will love my pineapple jalapeno smoothie, Chocolate smoothie bowl and my turmeric smoothie bowl where its front and center. Do you like hemp seeds? So, its your turn to tell me. When was your first taste of Tabouli and what did you think of it? Thank you, Zouhair. I have a lot of respect for the traditional way that tabbouleh is made. Its one of my favorite Lebanese food to eat, so, I am always mindful of the way the recipe is made. I love using “BURGUL” too but my readers don’t know that. I used to get complaints that its supposed to be “Bulgar”, lol. I didn’t use mint in mine because I didn’t like the combination of mint and amaranth. But, I will give it another try. Thank you so much for your great and constructive comments. There needs to be more of you around the internet. So glad to have you as a fan and a subscriber. Thank you. I was drawn in by the beautiful colors and now I am hooked on the flavor!! My family absolutely loved your tabouli recipe! Thank you, Michaela. 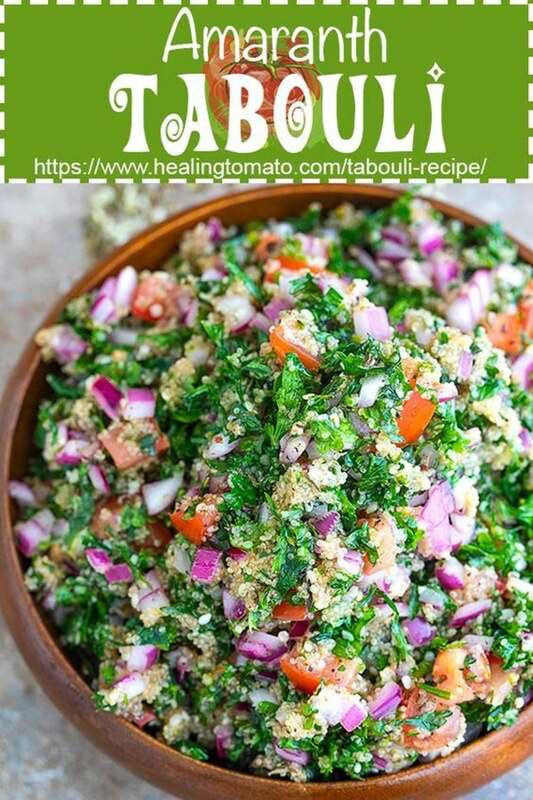 Its my all time favorite tabouli recipe. 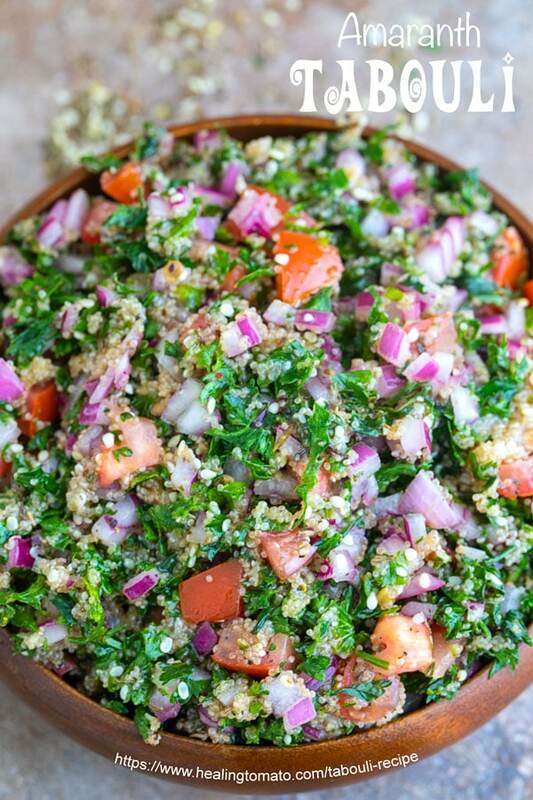 I fell in love with tabouli when I worked across the street from a deli across the street! I can’t wait to try this version with amaranth grain! I absolutely adore this recipe. Tabouli already has great flavor, but you’ve taken it and expanded it times 10! Love all the tips and facts too, thank you! 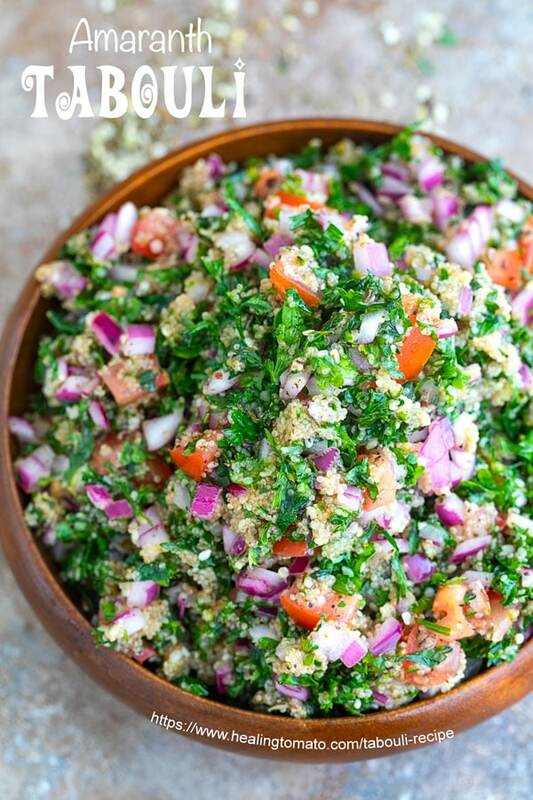 I have some tabouli on hand and the rest of the ingredients to make this recipe! I love all the vibrant colors and I think olive oil is a healthy fat, so bring it on! Interested to try this with riced cauliflower too! I’ve never tried making tabouli! Now I have to give it a try! Thank you, Madi. 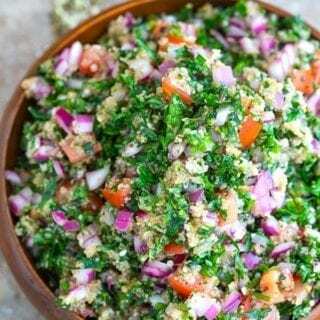 You will love this tabouli recipe because its so delicious. I love tabouli! It is so fresh and full of nice herbs. Using amaranth is such a wonderful idea (I wish I thought of it). My son is vegetarian and I know he is going to love this!! I just found Amaranth at my local Sprouts market and was looking for something to make it with when youre recipe popped into my email box! Hows that for perfect timing! I love tabouli so much… but I too have never tried it at home! Going to fix that asap! Thanks ! Thank you, Michele. That Makes me so happy to hear. Tabouli is one of my favorite dishes and it is something that I have yet to make. Thanks so much for the awesome recipe!